Polaris scribes the underside of Delicate Arch. 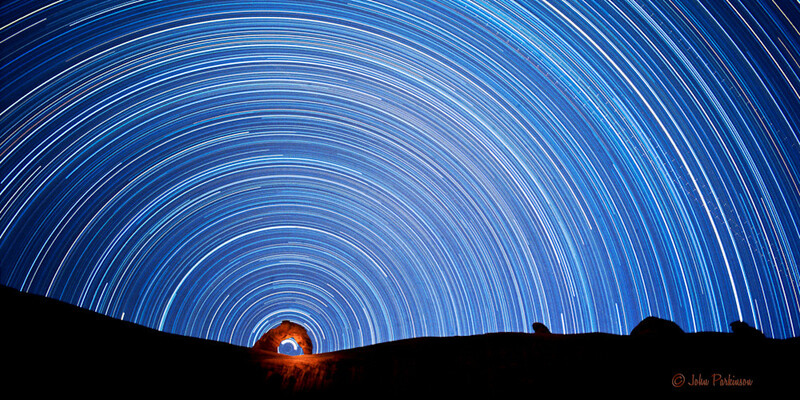 Making this image required considerable planning and preparation plus a big dose of good luck for this eight-hour exposure of the North Star scribing the inside of Delicate Arch. It had to be made within a few days of new moon so that the contrast of the stars against the dark sky would not be compromised by lunar illumination. It also had to be made in Autumn when the arc of Polaris is at the top of its circular path during the night. Essentially, then, it was only a once or twice a year opportunity. The precise camera position was critical, so I waited until I could identify Polaris and then I located my camera so that when I opened the shutter of my tripod mounted camera, Polaris would be just inside the right leg of Delicate Arch. Here is where serendipity kicked in. The sky remained cloudless all night and the radius of the arc of Polaris was, with hopeful intent, almost spot on in scribing the underside of the arch. I illuminated the arch itself by shinning my 3-D cell flashlight on the arch for about 30 minutes. That was just a lucky guess. It was a calm night with no wind to shake my camera and no desert critters to come by and bump my tripod. All in all, I was pleased with the result after making a 350 mile round trip and staying up all night just to get one exposure.